Rose Absolue is an early Goutal fragrance, released in 1984. It was difficult to find for a while — in the United States, at least — but now it seems to be more widely available. Annick Goutal said of Rose Absolue, "Roses symbolize beauty, the eternal feminine. I wanted to dedicate a perfume to them which would also evoke this femininity." This fragrance is all rose: it contains essences of May rose, Turkish rose, Bulgarian rose, Damascus rose, Egyptian rose, and Moroccan rose. Rose Absolue is both delicate and radiant. Like a gradually opening rose, it shifts from dewy to velvety to slightly dusky. If someone asked me to recommend just a few high-quality rose soliflores, this would be on my list. Ce Soir ou Jamais is Annick Goutal's "interpretation of a rose in a 'priest's garden' which she stumbled upon." It was the last fragrance that Goutal herself developed, working with perfumer Isabelle Doyen, and it is a composition of Turkish rose, ambrette seed, and "a blend of essences kept secret." Ce Soir ou Jamais drenches its rose with ambrette, a note that often reminds me of apple juice. There's something like lily of the valley in the heart, too, and then Ce Soir turns into a honeyed rose with a pale, ambery halo. The base of the fragrance has a slightly sour note, like damp flower stems. I also detect an accord that reminds me of champagne, and I happen to feel the same way about Ce Soir ou Jamais that I do about champagne: I want to love it. It never quite gels for me, but it does have some very devoted fans. Quel Amour! was created in 2002 by Annick's daughter, Camille Goutal, in collaboration with Isabelle Doyen. It was one of the first fragrances I ever tried at the Annick Goutal counter, and it is still one of my favorite Goutals and one of my favorite spring fragrances. It was inspired by an occasion on which Camille's fiancé welcomed her home from a long trip by lining the stairs and hallway of her apartment building with peony and rose petals; its notes include wild roses, rose geranium, pomegranate, blueberry, red currant, cherry, wine peach, and grey amber. I particularly enjoy the Eau de Parfum formulation, which offers a good balance of tartness and sweetness and lasts longer on my skin than many other Goutal fragrances do. 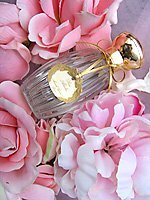 Goutal recently released a limited edition Eau Parfumée of Quel Amour!, with less peony and more sparkling red currant, that would be perfect for summer. Rose Splendide, a limited release from 2010 (and another Isabelle Doyen creation), includes centifolia rose, magnolia, pear, musk, and vanilla. The syrupy pear top note made me fear that Rose Splendide would turn out to be a big sister to best-seller Petite Chérie; fortunately (to my mind), the pear fades and the rest of the fragrance pairs its fresh rose with a longer-lasting leaves-and-grass note that could have been borrowed from Eau de Camille. The musk is very light and just a touch peppery, and the vanilla isn't noticeable. Rose Splendide is offered only as an Eau Parfumée. It took a while to grow on me, which is too bad, since it's a limited edition and it's reportedly nearly gone. If you're curious, you shouldn't wait too long to try it. Gather ye rosebuds... well, you know. Ce Soir ou Jamais and Quel Amour! are both available as Eau de Toilette and Eau de Parfum, and Rose Absolue is an Eau de Parfum. Quel Amour!, Rose Absolue, and Rose Splendide are also offered as limited edition Eaux Parfumées. For purchasing information, see the listing for Annick Goutal under Perfume Houses. I don’t get any pear syrupy sweetness in Rose Splendide, maybe just fresh cut fruit and that is fleeting. After that it’s creamy and cool and I want to drench my senses in it. I love it and want a FB for summer badly! My daughters adore it too. When I sprayed them with my decant ,they inhaled and promptly insisted that I get a bottle. Well darn it, girl, now I want to try it. I think your baby girls are my scent twins!!!! Tamara, I wish I didn’t get that fruity note at all… but the rest of the fragrance is so nice; really a summery scent, like a rose garden surrounded by freshly cut grass. For some reason, I am unable to detect much rose in Ce Soir ou Jamais or Quel Amour. My nose is funny that way; I can seldom detect the rose in anything but rose soliflores. I haven’t sampled Rose Splendide, and I probably won’t. I doubt I’d care for it, and am trying to cut back on rabid sampling. I must admit I’d still like a sniff, but I’m not feeling frantic about it! I know what you mean, Joliefleurs. Joile- it’s not “funny” at all. Perfumes have the power to move us, I love when it happens to me, my heart catches in my throat, I sniff away and am instantly in touch with what you speak of. Thanks for the reviews, Jessica. I really enjoy Quel Amour! but didn’t know about the inspiration behind it. I also think the pink bottle pictured is very cute. Jill, I wish I’d bought my Quel Amour! in that butterfly bottle! It costs a bit more, and it’s a splash bottle. I opted for the traditional spray bottle instead. Oh well; regrets! I always said, “I don’t like rose fragrances.” What’s weird is that I now have about a dozen of them, decants/bottles. Haven’t tried any of the AGs, though! Favorites from other lines: Liaisons Dangereuses, 3 Fleurs, Chanel No 18, Agent Provocateur Diamond Dust. Well, there’s such a range of rose interpretations and blends, I’m not surprised you’ve ended up with a few to love! I’ve never tried AP Diamond Dust… will have to seek that out. Karin – I’m just thinking if that Rose Splendide becomes impossible to find – boo, hoo – I’ll just spend that $$ on some Liaisons Dangereuses, which is just so super gorgeous!!! I must have been a total space case b/c I had no clue…. Ah yes…Liaisons Dangereuses! Very nice. I have been curious about Diamond Dust forever. Is it really rosy, or just so-so? Jessica – these reviews are so nice to see. I love Goutal and her roses! I can see why Ce Soir ou Jamais is so hard to love. I found that the edp version was much more wearer friendly than the edt which got a bit thin in parts and made the pear accord stick out too much. I particularly like to layer the CSoJ edp with her Vanille Exquise which makes a very nice rich woody rose. I love Rose Splendide so I am sad to hear it is limited distribution. I have a bottle split and figured I had lots of time to get another. Oh well, we’ll see how that goes! I can never decide whether or not I want to buy Quel Amour! It is very pretty – I’ve not tried the edp, so maybe that would be the ticket. And I have the same problem with Rose Absolue – can’t ever decide. Whenever I want it, it’s not available at discounters, when I don’t want it, I see it everywhere, lol. Isn’t that always the way, hah! Cool! I’m glad I’m not nuts. The pairing kind of happened by accident for me, and I was really happy with the results. That gaiac in VE really grounds the fruity rose in CSoJ. Great minds!! I’ll have to try this, too! Does anyone know which type of rose has that light, plush scent, not quite as heady? I smelled a rose bush once that smelled so refreshing and pretty, but I don’t know the species. I have no real basis for saying this, but I’d recommend you look for Rose de Mai, May rose, etc; it’s the one rose that I cannot abide, for that very freshness you mention. Very light and fresh. It smells like Ban roll-on deodorant to me, though. DelRae Coup de Foudre and MDCI Rose de Siwa are the scents I associate this rose with, though the MDCI doesn’t mention it. They are both lovely scents, don’t let my negative associations dissuade you from trying them. I second that recommendation for Coup de Foudre as a fresh, pretty, non-heady rose fragrance. Parfums de Nicolai Rose Pivoine is also a lovely soft rose – wears very pretty, almost prim, but really sunny too. There’s that nice 30 ml size from PdN that is $ friendly too. I love those smaller sizes from Parfums de Nicolai. Thank you for the reviews and a great jumping off point for exploration. It is funny, I love rose fragrances and A Goutal but haven’t tried any of these. I used to wear Eau de Charlotte and have a bottle of Sables (which I adore in winter) but the Goutal outright floral scents, like Songes, just haven’t worked for me. *Furiously adding on to scent sample list, which is almost as long as my Amazon saved item cart. Ruth: I find a lot of time AG florals in the edt just do not work for me – IMHO they tend to be inconsistent during their development. It’s often harder to find the edps in the US anywhere, discounters or not. The edp’s tend to be richer and hold their formulas better. If you ever find you have the energy to get into it, finding the edp’s may make a lot of difference. I agree with Ann about the EDTs and will add that they also tend to smell sour on me. I do prefer Quel Amour! and Heure Exquise in their Eau de Parfum versions, which both feel deeper and more rounded to me. Heure Exquise in edt and edp are nearly different fragrances! I love both formulas, but the HE edt is very aldehydic-galbanum-iris, and the edp is more of a aldehydic-warm rose-sandalwood. Both gorgeous, but very different indeed. AG is definitely a line that needs tested first. Oh, Eau de Charlotte! That’s a nice one, and it’s a floral/gourmand that isn’t overly sweet. I always get Eau de Charlotte and Eau de Camille mixed up. I’ve tested both – the one smelled like cut grass and the other like baby shampoo. Any tips on which was which? Eau de Ciel is my favorite of those eau’s de “C” – smells like linden blossoms and warm hay. And Eau du Ciel is line-dried sheets on a hot summer day, with hay drying in the field next to the house, for me. That sounds disparaging, but it isn’t meant to be. I think it’s very comforting. Clean, definitely… it reminded me of bubbles. I like it, though! Thanks for the tips! I totally get the line dried linen thing, Mals. Yes, Eau de Ciel is the best of that kind of intimate, country fresh summer. It reminds me specifically of the sun warmed wild fields behind the house where I grew up. There is that evening, sweet meadow smell that makes me think of home. Eau de Charlotte is blackberry jam and green underbrush dusted with cocoa powder. I went back and found by old bottle of EDT (almost gone!) from 7 yrs ago, still lovely. Haven’t tried Camille, though I’ve always intended to because I like greener scents for summer. I hereby coin a new term for sweet flower-and-edible fragrances: fleurmand. I wish I loved Serge Lutens Sa Majeste… there’s something about it that bothers me when I wear it. The same goes for Jo Malone Red Roses. Too bad! Must be a matter of skin chemistry as JMalone’s red Rose takes 2nd place for me! Despite my name, I’m afraid I’ve yet to find a rose scent that I adore (I like Lipstick Rose, but it’s sort of an outlier “rose,” IMHO). I wish I could find one that reminded me of BK Rose Oud without the oud. . .any suggestions out there? Hello, MR — I haven’t tried that one, because I tend to avoid anything with “oud” in the name — but I’m sure someone here can suggest something! I agree, Marjorie Rose, that BK rose is really beautiful, and I think BK Liaisons Dangereuses has a similarly beautiful rose note, accented by plum rather than oud. I adore it in the Fall, and it’s my favorite rose so far, together with Rose Oud. I haven’t worked my way through all of them yet, but the Parfums de Rosine sample set of something like 20 rose-focused perfumes is a great deal. I’m sure I’ll end up with a FB of at least one of them (quite possibly Rose Kashmirie). They are quite diverse – this might be a good way to meet your match. I’ll have to dig out my sample of Liasons Dangereuses and try it again. I did get a few samples of Rosines from a perfume fairy and sadly didn’t like any of them, but it sounds like the house is pretty diverse. I don’t like “old lady” rose. What I liked about Rose Oud was how deep and complex the rose was–much more like sticking my nose in a bloom than anything else I’ve sniffed so far. Have you tried Rose Ikebana? Thank you for these reviews, Jessica. Rose Absolue is hands down my favorite rose. I love it so much that I combined it with Joy to form my wedding day fragrance. I also love Ce Soir Ou Jamais, but have never tried the other 2. Thankfully, Daisy’s about to remedy the Rose Splendide so that I’ll just have to hunt down Quel Amour. OpearFan, What a beautiful way to smell on your wedding day!! i wore a jasmine sample yesterday without having to scrub it off (received as an extra in a swap) so im convinced tastes do evolve the more you sample.